2) Were tortured by the awesome smells of grilling, because everyone and their brother decided it was a nice night to host bbq's in the park. 7) And last, and perhaps the best, the group doing some 'Live Action Role Playing,' like in the film Role Models. Priceless. 1) Finish my training plan-stick with it 'til race day. I'm sure this will help my recovery, and that way I won't feel like an invalid hobbling down stairs for the week following the run. It also might help me achieve goal numero dos..
A confession...The Nike Women's Half Marathon. Expensive travel...gotta love those reward credit cards. Though I don't have enough to pay for the full ticket, I've got enough points to take the price to the reasonable range. Plus, I wouldn't need a hotel-another major perk. Just the spending $ and the ability to get out west. Definitely do-able. Plus, this HAS to be my year to get a teaching job, right? Lastly, running another half. Really, not too tragic. I figure the 10K I did in May is practically a half of a half, and I do have until October to ramp up the training again. True that only leaves me slacking until next month, but really nothing too terrible. Plus, that sense of accomplishment at the end is so powerful, it's addicting. So yes readers, it's official. I'm doing it. I'm San Francisco bound in October to run with 20,000 other ladies and get a great workout and the ability to eat as many freakin' calories as I want for the day. Who can argue with something that great? So we tried for the traditional "pasta" dinner, but our favorite Italian place was booked solid, so we ended up going Mexican and it worked out fine. Saturday morning dawned windy and chilly, but, it wasn't raining and for that I was thankful. Sure there was the occasional misting going on, but nothing to soak you to the core, it was actually pretty refreshing. The first mile as usual was the most difficult, something about getting moving and getting started and not seeing that first mile marker for what seems like forever is tough. The course was fairly flat (thank god!) but did have some hills near the end, which really weren't too horrible. I hit the half way point and kept thinking how the heck am I going to keep up this pace and go 3.1 more miles?! Luckily, I had a running buddy. My friend Jenna conned me into signing up for the 10K instead of the 5K to run it with her. She definitely kept me moving and it was nice to have someone to chat with and pass the time. Eventually we turned that last corner and saw the best sight ever, "Finish Line!" Picked up the pace a teensy bit and crossed the line in 01:04:10! I was SO incredibly excited! The last "10K" that I have a time on was from the half which I kinda sorta actually trained for and that was a time of 01:16:13. Somehow I shaved 12 minutes off my time! I know there are so many people who are much faster than me, but for me, someone who generally does 11/12 minute miles for longer distances, it was a major accomplishment! So bright and early the alarm went off, and I only hit snooze once. The rain looked like it might let up...I was wrong. The whole drive in was wet. We parked. Still raining. Picked up my packet. Still raining. Waiting with friends for the race to start...you guessed it, still raining. I gave in and put on the oh so fashionable rain poncho as we lined up. Best move ever. The rain was pretty steady through the first two miles, as I came up on the water station after mile two, I decided to ditch it since the sky decided to stop leaking as badly and I was getting toasty. It was a good move. Well, we did it. :) Despite threatening rain, overcast skies, on Sunday Rex and I did the Susan G. Komen 5K in Lansing along with friends and family and survivors and the memories of those who couldn't be there to share the journey with us. A big thank you goes out to his sisters who took the time to organize a team, design some awesome shirts, and basically create a group to fund raise for such an important cause that has touched so many people. Plus, it was a chance to get back out and hit the pavement again, which is always a good thing. I was so proud of Rex, he ran the WHOLE thing with me. We weren't super speedy, but we did it. Didn't stop once. We'll see if I can con him into another one anytime soon. Next up, Heart of Spartan 5K next weekend! Woot! Can't beat a finish line at the 50 yard line of Spartan stadium, Go State! I did it!!!!!! And right around the time I thought I'd do it in to boot! There's so much to say, but first I want to thank everyone for their support and advice. The top two pieces that helped were 1)Don't start off too fast, pace yourself and 2)Take your time at the water/aid stations. Not starting off too fast was key. I was thinking we were going to do a walk/run combo since the training had pretty much come to a stand still, but Kari thought we could do it as long as we paced ourselves. We aimed to start with around a 12 minute mile pace...and in the end, it worked out to 12:12 miles. I was incredibly happy with that. Walking through the aid/water stations was also huge. I tried to jog through the first one, ended up gulping my water, and felt it sloshing around for awhile. After that, I walked through them. It was much, much, much better from there on out. So the race...the night before I was so crazy nervous. We had a lovely diner out at Olive Garden, I nommed on some plain ol' spaghetti and breadsticks, guzzled water, and all was well. Tossed and turned part of the night, but was ready to go the next morning. Our hotel was about 3 blocks from the starting line which meant all we had to do was take a nice leisurely stroll over to the starting corral. We took a few silly pictures and anxiously awaited the 8 o'clock starting time...only it didn't end up being 8, it was more like 8:20ish. They started each corral in it's own wave start, which was nice, but added to the whole "waiting to start anxiety." Eventually we were on our way, and to be honest, I was still worried the first mile. My legs didn't feel like they wanted to move, let alone move for the next 13 miles. But Kari kept me going, we fell into our pace and kept chatting as we moved along. It really did help that there were so many other people around us doing the same thing, working for the same goal. I kept checking my watch and we stayed really close to 12 minute miles the whole time. There were some hills here and there, but after running in Grand Rapids, honestly they weren't anything too incredibly terrible. So we ran...and ran...and ran. Through some of the downtown, through the ritziest neighborhoods, and headed back toward the city. It was a long climb up a hill to the midway point, also were we were supposed to see my mom and Rex. I was hoping they made it because I was really ready to ditch my jacket and camera at that point. We spotted them and I awkwardly shrugged off the jacket, gave some high fives, and kept on moving. At the top of the hill, Kari decided she needed to slow the pace, I offered to stay with her, but she waved me on. So, I was off on my own. Without an iPod, just my own thoughts, the course bands, and my legs to carry me. I hit a mental road block as soon as I hit mile 9. It was the farthest I'd ever run before at one time, and I had no idea how I was going to keep going. Somehow I did and when I hit mile 10, I knew I could do it. I mean, it was just one more 5K and I'd be done. At least that's what I kept telling myself and it worked. I did stop for a quick bathroom break, and discovered...chaffing. No good, very bad chaffing. I'd had a feeling that it was happening, but seeing it made it 100 times worse. No matter, I still had more miles to put in, so I put my game face back on, blocked it out, and told myself I could deal with it later, after I'd crossed the finish line. The last couple of miles were pretty uneventful, I was in my own zone just trying to get to the end of it all. Mile 12 was tough. I'd thought the end was much closer, and it just stretched on, and on, and on. When I finally turned that final corner and saw the finish line staring me in the face, I can't even describe the excitement I felt! My legs found some energy, a smile plastered itself across my face, and I just ran with such joy. It was AWESOME! I rushed past the finish line, hands in the air, and excitement and pride for having accomplished something so huge. It was an amazing feeling. Kari came through about 5 minutes later and we posed for pictures, collected our goodies and met up with everyone else she knew, Rex, and mom. 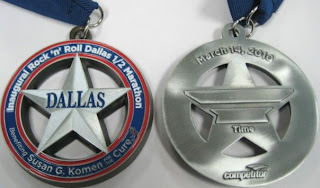 Had our medals engraved, snagged our free can of beer, free food, and settled in to watch Better Than Ezra rock out. All in all, it was a really great experience. Gorgeous weather, a great running partner, supportive friends and family. Awesome. The weather here is slowly inching toward Spring, and yet, my running shoes haven't hit the pavement in quite some time. I've had the fleeting thoughts that it looks like a great day for a run, but haven't made it out. But what about my half? It's less than two weeks away, how will I survive it? In short, it's been a mutual agreement between my sis and I that we're going to "run/walk" it. She didn't have as much time as she was hoping to train for it, and I was more than happy to start slacking. Running outside in the freezing cold, isn't really my thing it turns out. I'd much rather be out cross country skiing. :) Are you surprised? I am a bit, but to be honest, it was a bit of a relief. I was feeling guilty for not running and going skiing instead, and skiing is one of my favorite parts of winter, I couldn't stand that guilt and needless to say, am incredibly happy it's turned out this way. I'm pretty sure I'll be looking for another half a little later on this "running season," one that will have me training in warmer weather, because I'd definitely like to run a full one. For now, I'll keep enjoying a 5K here and there to keep my legs moving. Today I didn't run 10 miles. I was supposed to, but eh, it was one of those days. I opted to do 2 hours on the elliptical instead. Yes, I know elliptical running is nothing like outdoor running. However, at this point, it seems to be more about the endurance to be able to run 13 miles than anything else so I figured it would have to do. I'll do 10 next weekend or maybe 11, who knows. I'm trying really hard not to feel too guilty about "skipping" a long run. Maybe I'm just incredibly intimidated by the fact that it's my first ever double digit run? Regardless, I'm sure next weekend I'll rock it and all will be well. It will, right? 9 miles. In the books. Saturday's sunshine lured me out and I did it. It wasn't pretty, and it wasn't fast, and I had to lie to myself, but it's done and over with. :) I hit 7 miles and told myself, only two more to go and I'd get to 7 miles, and that I'd done 7 miles before so this was going to be cake. I obviously knew I was running miles 8 and 9, but to be honest it really helped mentally to pretend they were miles 6 and 7. At the end of the run I realized if I'd only gone 4 more miles, I would have done a half. Which, is crazy. or not. Not yet anyhow, although last week's run was ridiculous. 7 miles peeps. I have no idea how I'm going to do 9 this weekend. The temps are bitter, but I can't imagine spending more than an hour and a half on the treadmill at the gym without someone kicking me off. (More on the gym in a bit) So outdoors I'll go, I've got a rough map in my mind that loops back past the house in case I need to hit up the ladies room, I just need to get the motivation to go. I'm starting to really push myself on the "short" runs and allowing myself to just get through the long runs where I'm averaging around 12 minute miles, which, as long as I complete the run is fine by me at this point! It was a tough week in the world of running. I found myself dragging my feet more than I have in the past weeks to go out on my required runs. Maybe it's because I'm getting sick of running close to the same routes. But, I love the convenience of running out and back and ending up at home. Instead of driving somewhere, running, then driving back home. I'm all about convenience. I did miss one of my cross training days this week, but in the grand scheme of it all, I think I'll be okay. My legs did not fall off like I worried they would. Two weeks ago, week one of training, I ran 6 total miles, it wasn't as many as I was supposed to do, but with the holidays, I was happy to get even that many in. I also got a couple of days on the elliptical in to boot. It was a good week. This past week I did 10, which was MUCH better in terms of staying on training plan track. Today I ventured out on my long run in the chilly, chilly cold, did I mention is was freezing? There were many points where the wind just seemed to be mocking me. "Hey you silly lady, try running up this hill, not only is it a hill...but I will also huff and puff and make it impossible for you to climb it!" And so on and so forth for the miles. But I did it, and got my "long" run in today for a total of 4 miles.